I once had an AMAZING Crab Eggs Benedict at a restaurant in Malibu, and ever since then, I salivate at the mere thought of crab, hollandaise sauce and egg on a toasted slice of English muffin. Because it’s a breakfast recipe that I know isn’t very Weight Watchers friendly, I have avoided it, only indulging once in a great while. This past weekend, I was determined to make a healthier version that was low in Points so I could eat Crab Eggs Benedict more frequently. Knowing that the two most fattening components in this dish are the hollandaise sauce and the egg yolk, I knew sacrifices had to be made. The first thing I did was use a poached egg white, instead of a whole poached egg. Yes, I know that this means there’s no runny egg yolk on the eggs Benedict. But I don’t feel that it affects the overall flavor of the whole dish very much. Now, when it came to the hollandaise sauce, there was no way I was going to NOT use it. I am the kind of girl who is all about condiments and sauces, so I had to find a way to make this happen. I decided to try out a holladaise sauce recipe using liquid egg substitute instead of eggs and using my favorite butter alternative – Brummel & Brown Yogurt Spread. It worked perfectly! The sauce was delicious, and flavorful and exactly as I had hoped for. But it was a lot less calories than traditional hollandaise. A few other minor alterations to my Crab Eggs Benedict, and the delicious dish was a hit! And just 5 Points for the whole thing. Now I can eat my favorite breakfast on a very regular basis. I hope you enjoy it as much as I did! Enjoy a delicious, healthy Crab Eggs Benedict for a lot less fat and calories, but still with all the flavors you’d expect. Just 5 Points per serving makes this a great idea for a Weight Watchers Breakfast Recipe. Slice each English muffin in half, and toast. Poach 2 egg whites using a poaching pan or by following the instructions in the NOTES below. Empty lump crab meat into a bowl, and drain it of any excess water. To make the Hollandaise Sauce: Start by melting the butter in a small saucepan on low heat. Cook until butter is melted and turns golden in color. Set aside. In a medium sized saucepan, whisk together ¼ cup of the non-fat buttermilk, cornstarch, salt, and cayenne pepper until smooth and well combined. Add in the rest of the buttermilk and liquid egg substitute. Set the pan on medium-low heat, and whisk continuously until it begins to simmer and thicken. Remove from heat and whisk in the lemon juice and butter. On a plate, set one toasted English muffin half and top it with ¼ of the total crab meat. Then gently place your poached egg on top. 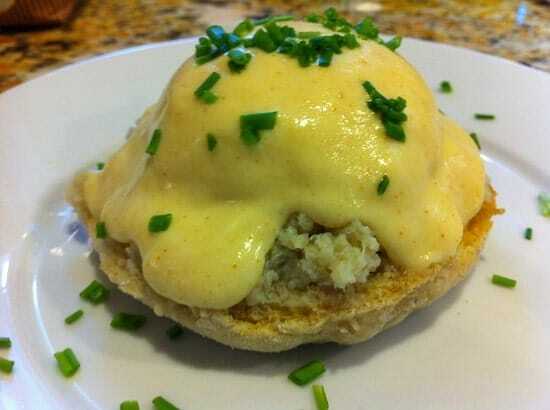 Top each Crab Eggs Benedict with about 1/4 cup of the hollandaise sauce, and garnish with fresh chives. Fill a small sauce pan with water and bring to a boil. The size of the saucepan and the size of the eggs will determine how much water you should use. You need at least a couple of inches of water in your saucepan for the poached egg whites to turn out right.While waiting for while to boil, crack an egg and empty the white into a small bowl or cup. To separate the egg white from the yolk, you can do this one of two ways. The first way is to use an egg separator. Simply pour the egg through the separator. The white will go through the separator and into the bowl while the yolk remains in the separator. You can then discard the yolk. The second way you can separate the egg is by cracking the egg shell into two parts. Hold one part in your left hand and the other in your right. Separate the egg by transferring the egg back and forth between the two parts. Keep the yolk in the shell and allow the egg white portion to go into your bowl. Once the water has come to a boil, bring the heat down to a simmer. Now add 1 tablespoon of vinegar to the water. Bring the cup with your egg white as close to the water as possible and gently pour the separated egg white into the simmering water. If you are using more than one egg you will want to wait at least 30 seconds for the egg to begin to set before adding a second one to the saucepan. This will help keep eggs from clumping together. Allow the egg to cook for approximately 3 minutes, If the egg starts to break up and spread around the pan, use a slotted spoon to guide it back to the center. When the poached egg white reaches the desired level of done-ness remove it from the water with a slotted spoon. This recipe is the first one that failed with my husband. He didn’t like it at all. I find it super funny you’ve posted this today! My hubby finally got back into town and we are supposed to eat brunch this weekend and I plan on eating the restaurants Crab Benedict! Also for x-mas he got me WW cookbook w a lightened up hollandaise, which I’ve alredy marked to recreate the Benedict I plan on eating this weekend. I’ve also saved Hungry Girls Crab Cake recipe to make.